Judiciary Chair Chris Lee (at podium) discusses the House bills passed to support good governance at a press conference today with House Speaker Scott K. Saiki (from left), Finance Chair Sylvia Luke, Vice Speaker Mark M. Nakashima, Representative Chris Todd, and Representative Stacelynn K.M. Eli. Honolulu, Hawaiʻi – House Leadership and Representatives gathered today to discuss a package of more than a dozen bills passed out of the House this session designed to reform elections, address money in politics, and fight public corruption. 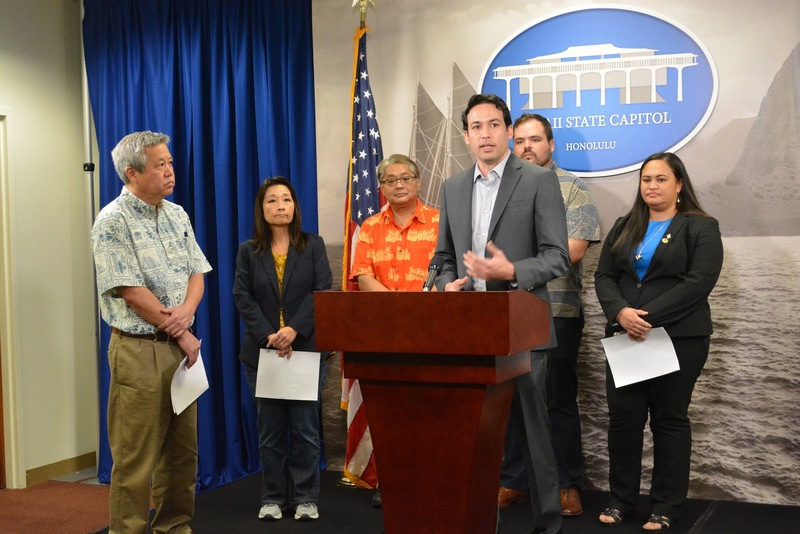 “We are making it our priority to take proactive steps to ensure public confidence in our elections process and government,” said House Speaker Scott K. Saiki. Representative Aaron Ling Johanson, Chair of the Labor & Public Employment Committee and introducer of HB391 HD2, added "It's important to reduce the potential for influence peddling and ensure that those who wield power in public trust positions cannot exert disproportionate influence over elections. Establishing a state version of the federal Hatch Act will help better protect the integrity of our elections." "This past election cycle has made it clear that our state needs an automatic recount law on the books," said Representative Chris Todd, who introduced HB428. "The integrity of our elections should never be in question and is the foundation of a healthy democracy and public trust." "With declining voter turnout, I wanted to make it even easier to vote, especially for our young people. This will allow them to take up their civic duty to chart the future of this state," said Representative Stacelynn K.M. Eli, who introduced HB 1217 HD1. "That power comes from power of the vote. It is my hope that this will encourage young people and everyone in the state to engage in the voting process." HB1248 HD1 Makes it easier to vote by establishing voting by mail for all elections statewide for 2020 and expanding in-person voting and ballot drop-off hours. HB428 HD1 Requires an automatic recount of votes cast when the difference is equal to or less than 100 votes or 0.5 percent, whichever is greater. HB709 HD1 Proposes an amendment to the State Constitution which enables laws allowing for the automatic recounts of votes in an election. HB1485 HD2 Establishes a process for automatically preregistering or registering public school students to vote who are at least 16. HB1217 HD1 Requires that people who apply for a driver's license or identification card are automatically registered to vote. HB1380 HD1 Creates a comprehensive public funding program for candidates for county elections beginning in 2022. HB162 HD1 Significantly increases fines for campaign finance violations. Prohibits the establishment of noncandidate committees that only make independent expenditures within 14 days of any election. HB1490 HD2 Closes a loophole in the prohibition on political contributions by state and county contractors by including officers or board members of those companies as prohibited donors. HB163 HD1 Adds campaign spending report filing deadlines of April 30 and October 1 of a general election year for candidates and candidate committees to ensure greater transparency before absentee ballots mail out. HB361 HD1 Prohibits the governor or any county mayor from receiving any outside compensation or emolument while in office. HB391 HD2 Enacts state laws mirroring the federal Hatch Act which restricts state employees and officers who perform adjudicatory, regulatory, law enforcement, or investigatory duties from participating in partisan political activities. HB712 HD1 Requires candidates for governor, mayor or president to disclose their tax returns to the public to ensure their decisions are made in the best interest of the public and not their own financial gain.